TOTAL supports THE LOUVRE. An unprecedented performance of the Liberons le Louvre collective in the context of global mobilization for the disinvestment of fossil fuels. Courtesy Liberons le Louvre. Libérons le Louvre is certainly not the first activist organization to use the museum as a stage for performance art-protest. Art museums have a reputation for stodginess, elitism, and disengagement from both popular culture and current events. Modern artists may be recognized as the heralds or even the drivers of change, but the museums which house their art generally are not. Yet art museums have often been the sites of revolutionary activities with consequences far outside the ‘cultural’ sphere. As long as art museums have existed, they have served their communities both as sanctuaries for the arts and staging grounds for political activity. The first art museums were princely collections of the private property of the wealthy and aristocratic. Their galleries were open only to friends of the owner, favored artists, and occasionally, to upper-class visitors. With few exceptions, the truly public art museum did not emerge until the late eighteenth century – and Paris’ Musée du Louvre is arguably the most notable of these pioneer institutions. The creation of the Louvre museum was itself a revolutionary act. Technically, the Palais du Louvre first became a museum in a small way when Louis XV decided to open a few corridors of the palace hung with artworks to select sections of the public. Unfortunately for Louis XV and his successor, this minimal gesture toward public access was an inadequate response to the following revolution’s demands to eradicate the ruling classes and its institutions. In 1793, Louis XVI was guillotined on the Place de la Révolution, (now the Place de la Concorde), a few minutes’ walk from the doors of the Louvre. Six months later, the post-Revolutionary government transformed the entire palace into France’s first truly public art museum. When the Palais du Louvre became the Musée du Louvre, one of Paris’ most potent symbols of royal power and luxury was officially converted to the republican cause. Public art institutions like the Louvre are taken for granted today – perhaps too much so. In the 1790s, however, the provision of a dedicated site for the education and amusement of artists, workers, and the bourgeois was a startling innovation. The political tumult of the nineteenth century in France repeatedly found expression in the changing status the Louvre, which once more served as the residence of a dictatorial leader, during the reign of Napoleon I. 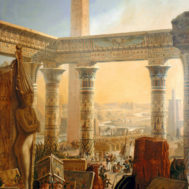 In the short-lived Second Republic, the Louvre was re-christened ‘the people’s palace,’ when it was the site of government-sponsored construction projects undertaken as part of the Republic’s ‘right to work’ program. 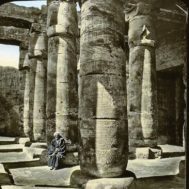 In the modern era, the larger museums in democratic nations have grown increasingly independent from their governments – their own, massive internal bureaucracies have immunized them from a degree of government control, but have also contributed to their modern aura of cultural isolation and political detachment. The Musée du Louvre has become a symbol of elite power in its own right, provoking protests even while providing inspiration for those who protest against it. Liberons le Louvre, screengrab from video, courtesy Liberons le Louvre. 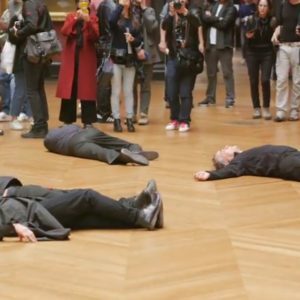 Libérons’ protest took the form of a staged ‘die-in’ within the Louvre itself. 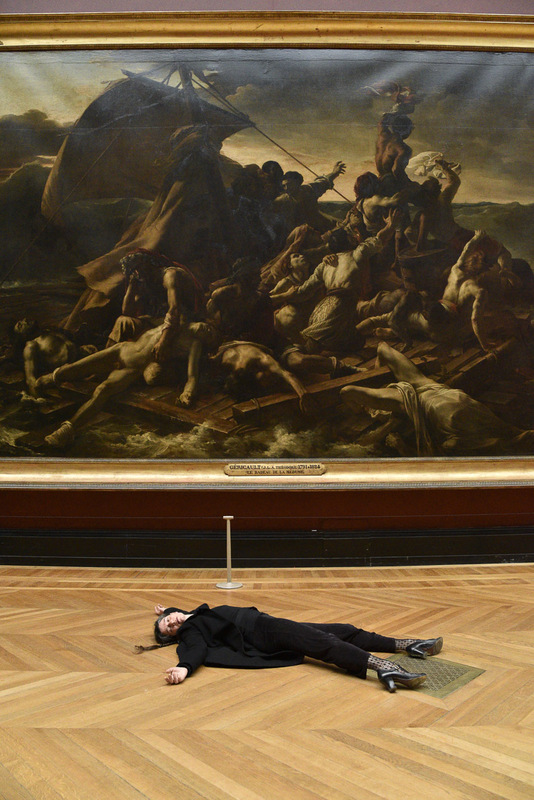 About a dozen black-clad activists collapsed one by one on the floor in front of one of the museum’s most famous paintings: Théodore Géricault’s Raft of the Medusa. The choice was a deliberate one: Gericault’s painting was a highly provocative political and artistic statement when first exhibited. It depicts the few survivors of the Medusa, a French ship whose accidental sinking off the coast of Mauritania turned into a national scandal embroiling the post-Napoleonic government in charges of incompetence. Géricault’s work was also seen as abolitionist and anti-imperialist. Today, the image of bedraggled people lost at sea is evocative of other, equally controversial topics: the refugee crisis, rising sea levels and the annually worsening hurricanes which threaten coastal dwellers. All of these implications are caught up in the protesters’ performance, which attracted the attention of dozens of museum-goers before guards evacuated the hall. Libérons le Louvre has presented other performance-protests at the museum. In 2016, activists draped black swathes of fabric – symbolic of oil slicks – down the grand staircase from the landing on which the Nike of Samothrace stands. Much as Gericault’s Raft of the Medusa served as the ideal companion piece to Libérons’ performance of death and despair, the Nike was well suited to the protest unfolding at her feet. The Hellenistic sculpture, which represents the winged goddess of victory alighting on the bow of a ship, recalls the marine environment degraded by spills from deep-sea oil wells, and suggests divine sanction of the environmentalist’s struggle. Comparable demonstrations at Tate Britain, Tate Modern, and the British museum in the 2010s led – or at least contributed – to the termination of those museums’ exhibitions’ sponsorship by British oil and energy giant, BP in 2017. A group named Liberate Tate staged strikingly artistic demonstrations at the museums. 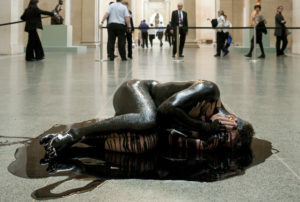 For Human Cost, a work of unauthorized performance art which took place at Tate Britain in 2011, activist-artist Amy Scaite lay, covered in oil, on the floor of the museum for 87 minutes. The performance’s intent was to remind visitors and the museum itself of BP’s catastrophic 87-day oil spill in the Gulf of Mexico. Amy Scaife’s protest performance Human Cost at the Tate Britain’s Duveen gallery in 2011. Courtesy Liberate Tate. Identity politics have featured in museum protests as well as environmental causes. In 2014, a group of artist-activists calling themselves the “Cliterati” descended on the Whitney Biennial to demand that the museum display and celebrate more women artists. The protesters arrived in colorful costumes, and roamed the halls of the gallery on a Friday evening, when the museum was open to the public on a pay-what-you-will basis. The museum guards did not intervene while the protesters danced, chanted, and engaged visitors in conversation about gender in art, while others were blindfolded and played word-association games with the interloper artists. The protests in London, Paris and New York were uniquely suited to their location and context. Within the halls of the London museums, activists sought ways to communicate their concerns through performance art. At the Louvre, specific artworks within the collection harmonized with the protester’s own artistic statements in situ. At the Whitney, when asked, several patrons said that they assumed the event was, in fact, museum-sponsored, while none of them felt the happenings were ill-suited to or disruptive of the exhibition around them. These protests honor the higher mission of art museums, even while they disagree with their particular policies. The environmental protesters argued that museums represent the best of what humanity can achieve, and demean themselves and the artworks they protect when they stoop to accept money from corporations which profit off of the destruction of the natural environment. The Cliterati did not dispute the Whitney museum’s role as a key site of artistic activity – they only objected to the imbalance in the gender of the artists admitted to its halls. To bolster their argument, all the protesters turned to the arts, presenting their views in temporary sculptural installations and performance art. Thus, though the protests are against the decisions of the museum’s administration, they are also protests for the art museum as an institution. Their campaigns in defense of the art museums’ moral integrity and their appropriation of museum spaces and artworks are the strongest possible endorsement of the art museum’s role as an indispensable public venue for artistic education and political expression. Museums have not, of late, been only the targets and platforms for unauthorized protests. They have also initiated public statements of their own. Like their critics, the world’s major museums know that they are in possession of a highly visible platform for political expression. They also know that art’s persuasive and attractive qualities make it a powerful tool for broadcasting statements to the public. 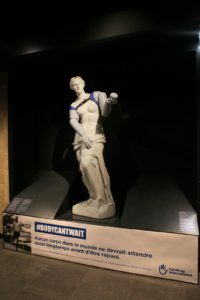 Handicap International gave temporary prostheses to original statues in Paris, photo courtesy Handicap International. This month, in Paris, classic statues are being outfitted with prosthetic limbs. The project is run by Handicap International in collaboration with Paris’ public works and museums, including the Louvre. A copy of the Venus de Milo, perhaps the most famous of Paris’s many damaged or truncated classical sculptures, will be among those receiving treatment. The art installations are part of a public awareness campaign on behalf of the 100 million people across the world who are in need of new limbs. Meanwhile, at the Palazzo Uffizi, Florence, a different kind of ongoing raising-awareness campaign is taking place. The museum’s director, Eike Schmidt, vowed in 2017 to increase the number and range of women artists displayed in the museum. The Uffizi is well-known for its stunning collection of Renaissance artworks, above all for Sandro Botticelli’s Primavera and Birth of Venus. However, there are many worthy but oft-overlooked female artists in the collection, including Artemisia Gentileschi and the Florentine painter Suor Plautilla Nelli – the latter’s works were featured in a special exhibition in the spring of 2017. In an interview with the Art Newspaper, Schmidt explained that his new commitment to gender equality in the museum was inspired by a conversation with the art-activist group Guerilla Girls. In this instance, independent activists and a landmark art institution have found common cause through their shared commitment to art and equality. Three years ago, in Seattle, an artist who embraced the ideals of Guerilla Girls and the Cliterati took it upon himself to rectify the gender imbalance in the Seattle Art Museum’s collection. Matthew Offenbacher is a Seattle-based painter who received Cornish College of the Arts’ Neddy Prize in 2013 – and chose to spend the prize money, all $25,000 of it, on a new conceptual artwork: Deed of Gift. The idea behind Deed was simple: buy artworks by local queer and female artists, and gift them to the Seattle Art Museum (SAM). Offenbacher’s project was inspired by an embarrassing incident at SAM in 2012. 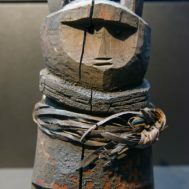 The museum hosted a touring exhibition of modern art by women artists from the Centre Pompidou. SAM’s curators decided to highlight the visiting show by re-hanging all their galleries with art exclusively by women – only to realize that they had far too few works by women in the collection to do so. Unsurprisingly, the Seattle Art Museum was delighted to hear from Offenbacher about his plans to help supplement their meager supply of art by queer and female artists, and Deed of Gift went forward as a collaborative project shared by the artist and the museum administration. It is both an artwork and public-spirited enterprise. There is a third way in which art museums and political protest can productively intersect: when the protest becomes a part of the museum’s collection. Both the Whitney Museum of American Art and the École des Beaux Arts de Paris are currently showing exhibitions of ‘protest art’. The Beaux Arts show, “Images en Lutte,” commemorates demonstrations by ‘l’extrême gauche’ in France between 1968 and 1974. The exhibition includes posters, paintings, sculptures, films and photographs from the marches and protests which took place in that riotous era. Its aim is to present “not a visual history of politics but a political history of the visual [pas une histoire visuelle du politique mais une histoire politique du visuel]”. The show at the Whitney, “An Incomplete History of Protest,” opened in August 2017. It also looks back at the protest art of the past, but its focus is on the present and, as its title hints, on the future. It is more concerned with artworks made for gallery display than with the ephemeral documents and images associated with the French protests. Yet the Whitney show likewise explicitly links the art objects to the historical moments which they address, considering the artists as direct participants in politics, not mere commentators on the events. In a novel twist, there are now some museums who go directly to the source to acquire protest art. The Smithsonian’s National Museum of American History and the Museum of the City of New York have both made a point of collecting banners and photographs from the major marches that have taken place in the last year. Artifacts from both the Women’s Marches in 2017 and 2018, as well as the recent March for Our Lives, have all made their way into museums. These marchers’ signs, taken from their hands and hung on museum walls, embody a new archetype of an old genre of art: art as outcry. Mauricio’s Cattelan’s America, Solomon Guggenheim Museum, NYC, By stu_spivack (DSC_0476), Wikimedia Commons. Finally, there are moments when art museums are able to speak directly to power. This winter, the Trump administration sent a request to New York’s Guggenheim Museum of Art. The White House wished to borrow their Van Gogh, Landscape With Snow (1881). 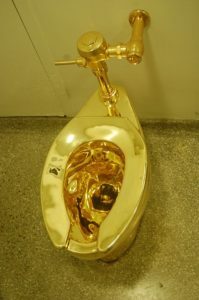 The museum refused, offering in its stead another artwork, Mauricio’s Cattelan’s America (2016) – a solid gold, fully functioning toilet. The Guggenheim’s response might seem unkind, and almost crude, but then, so might many of the actions and statements of the current administration. Cattelan’s America can be read as a commentary on this nation’s wealth disparity, our fixation on ostentatious celebrity lifestyles, even our obesity epidemic – or it can be seen as a cypher, an inexplicable, unprecedented, and witty paradox. In either form, it functions as an appropriate riposte to a president whose own love of all things gold and costly is well known, and whose administration’s guiding principles are sometimes as obscure as the most uninterpretable contemporary artwork. The Guggenheim’s rejection of the White House’s request recalls another instance when the lovers of art stood up to the powerful: when the modern art museum came into being, as French revolutionaries opened up the halls of the Palais du Louvre to the people of France. It is the latest – but certainly not the last – in a long history of art museums getting political.